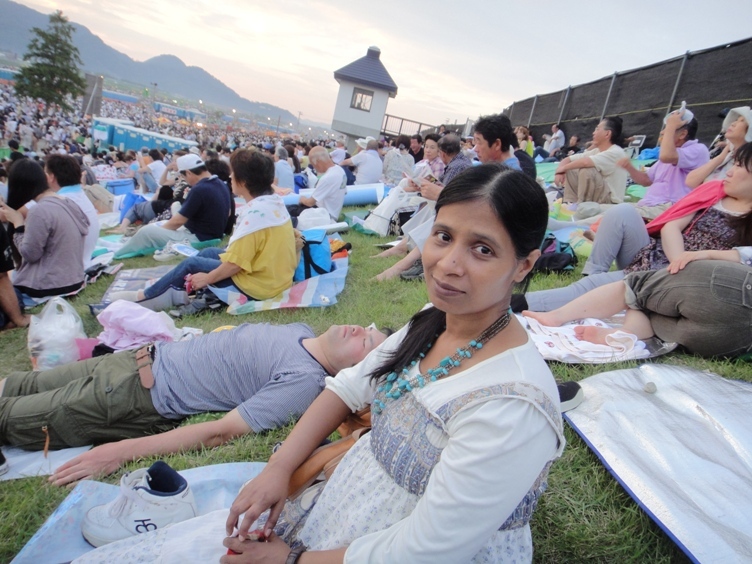 On 25th August, hubby and I went to see Omagari Fireworks Festival in Daisen City of Akita prefecture. 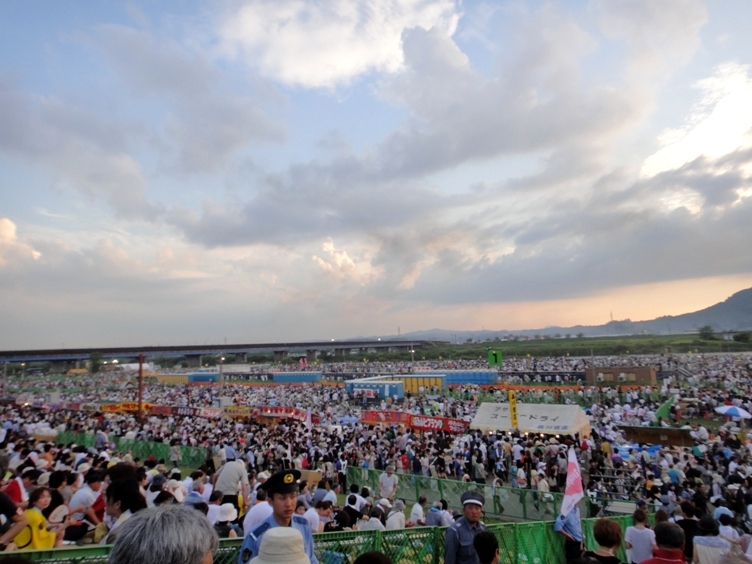 It is one of the major fireworks festivals in Japan that has been held since 1910 on the dry bed of Omonogawa River. It is actually an annual national fireworks competition where selected fireworks artists from all over Japan compete to show off their latest fireworks products and techniques. 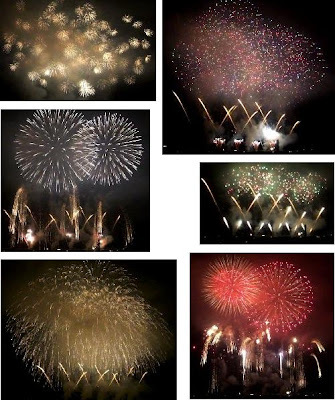 This year was the 86th edition of Omagari Fireworks Festival, and about 18000 fireworks were displayed. 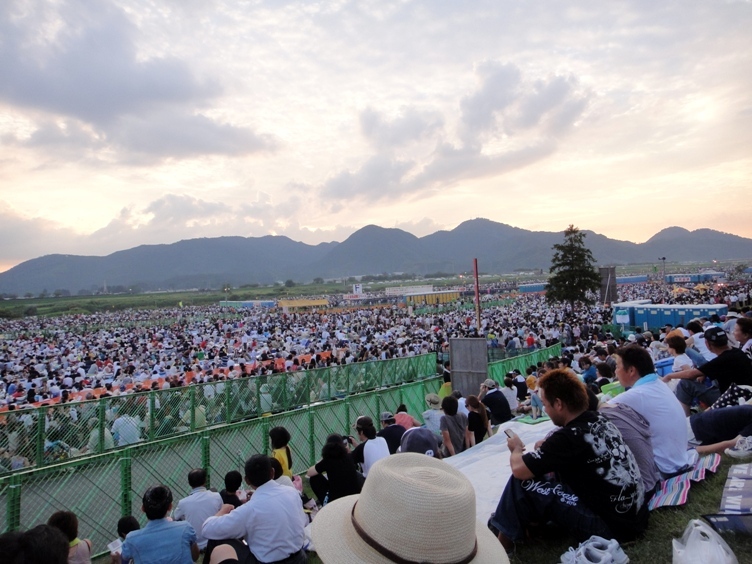 The festival attracted about 760000 spectators from entire Japan to Daisen City. For those who are interested, the details about Japanese fireworks, shapes, and sizes can be found at this homepage (please click here). 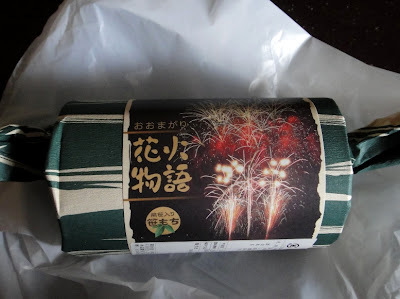 Hubby and I go every year to see Omagari Fireworks Festival, and viewing the fireworks has now become an annual ritual for us. On 25th August, we started from our home at about 9 am and took two foldable picnic chairs and a picnic sheet with us. 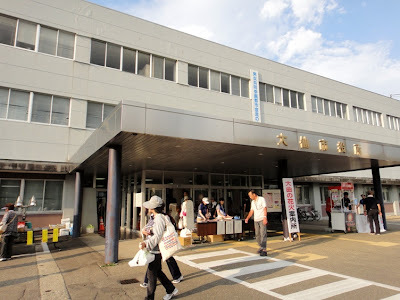 It took us about 1.5 hours of car ride to reach Daisen City. 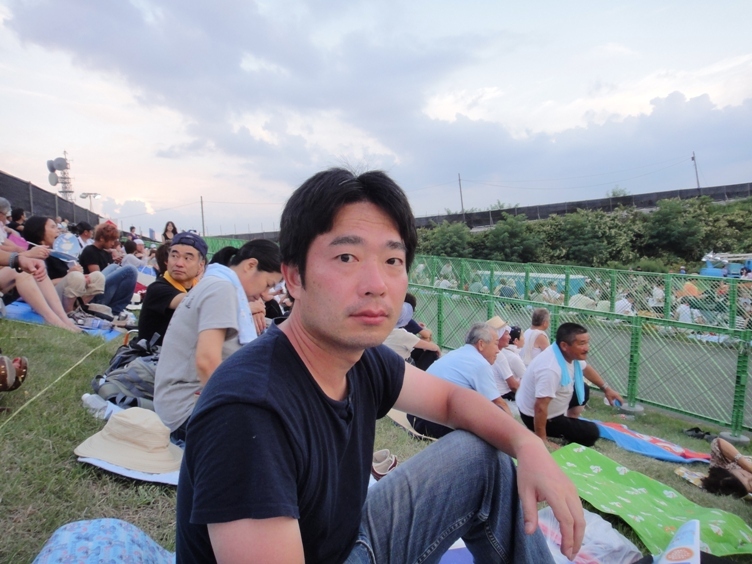 Hubby had to park our car at a parking area that was very far from the fireworks display venue. 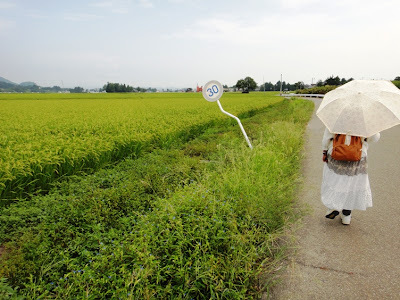 So we had to walk for about an hour to reach the venue. While walking we saw many rice fields on both sides of the narrow road. 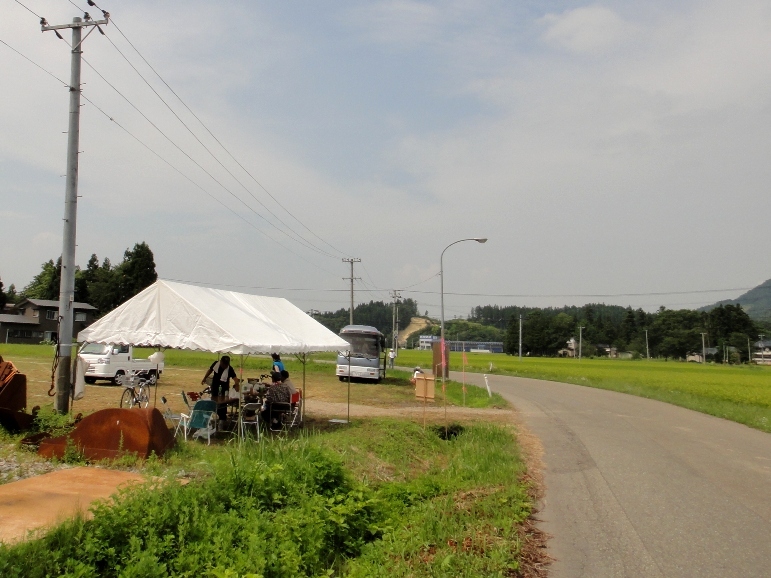 We also saw a few booths that were set up next to the road, probably to guide the visitors. 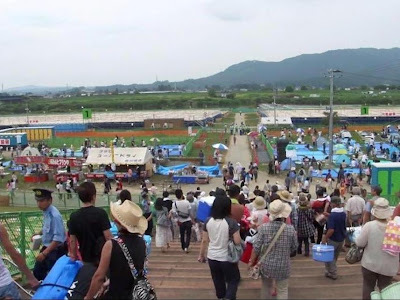 As we neared the festival site, we saw that many local police were busy helping in managing the large crowd. On reaching the festival site, we searched for an open area for seating and were lucky to get a nice place to sit within fifteen minutes of our search. We spread the picnic sheet and reserved an area of about 4 square meters, which was enough for us to sit comfortably and view the fireworks. The entrance of the festival site as viewed at about noon. 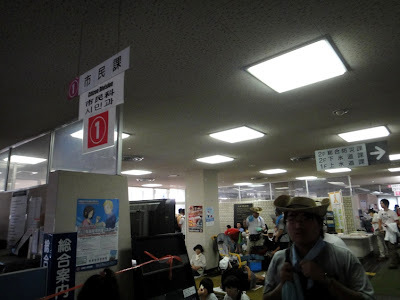 Note that there is hardly any crowd yet at the venue. After getting a seating area at the fireworks festival site, we realized that it was just 12.15 pm and still many hours remained for the fireworks display to begin. It was a sunny and hot day, and impossible for us to sit under direct sunlight for another 5.5 hours. So we left the fireworks display venue and went to a nearby park where there were many trees with shades. However there was hardly any empty space remaining, and so we just sat down next to a building. 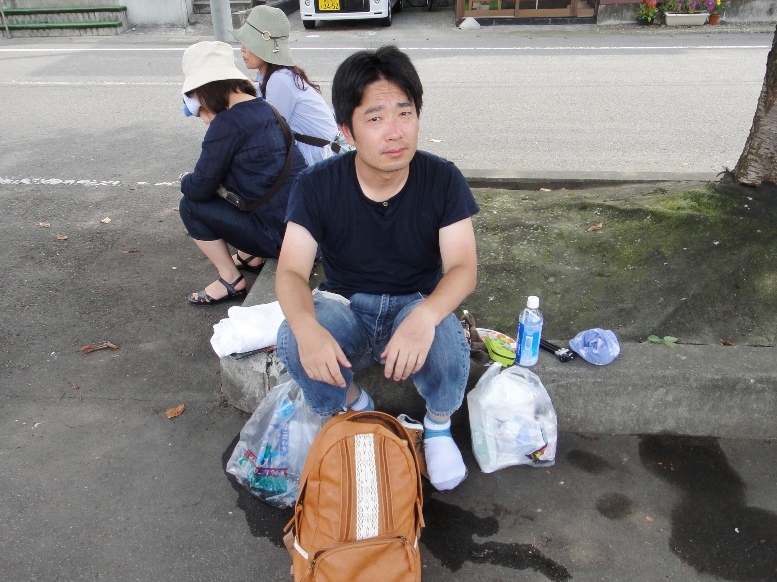 It was too hot and so we bought two packs of ice cubes to cool our feet. Hubby bought yakisoba fried noodles, yakitori skewered chicken, kakigori shaved ice dessert, and cold drinks from a nearby food stall. We had the food and yakisoba was really delicious. Afterwards the weather became extremely hot and humid, and therefore we decided to move and find another place to relax. Fortunately on that particular weekend day, Daisen City Hall was opened to the public and we could spend the next couple of hours in air-conditioned room. 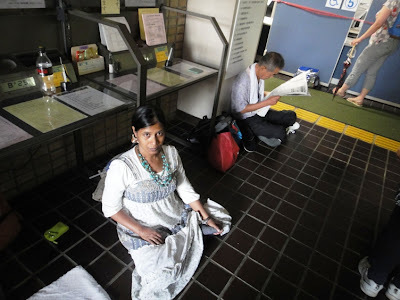 It was too comfortable inside the city hall, and we relaxed and hubby dozed off for a couple of hours. The display of daytime fireworks called hiru hanabi started at 5 pm but we skipped seeing it as we were not much interested. 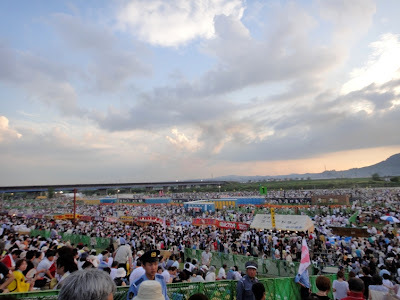 At about 5.45 pm, we left Daisen City Hall and walked back to the fireworks display venue. 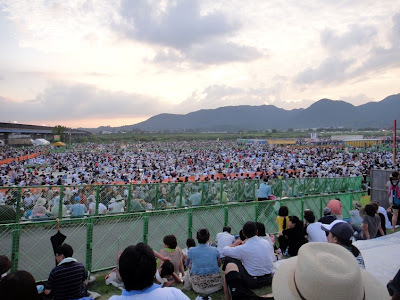 We had some difficulty in finding the seating area that we had reserved earlier in the day as the crowd at the festival site had increased tremendously. 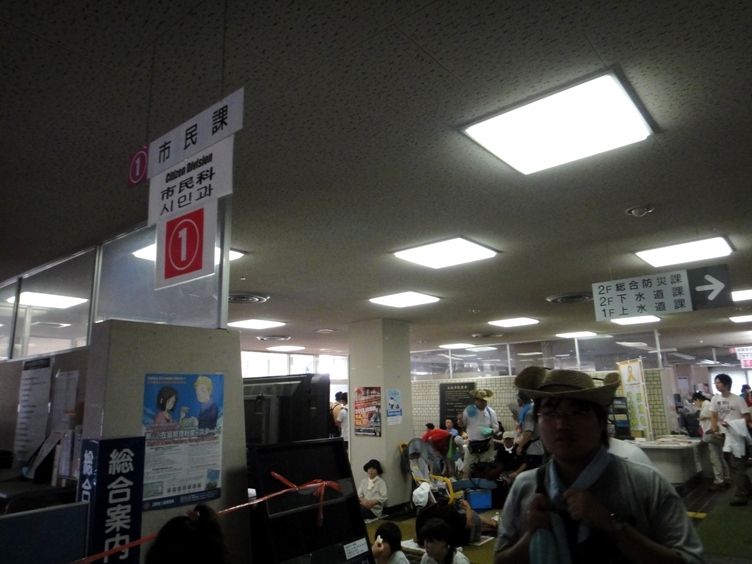 Eventually we found our seating area and sat down. 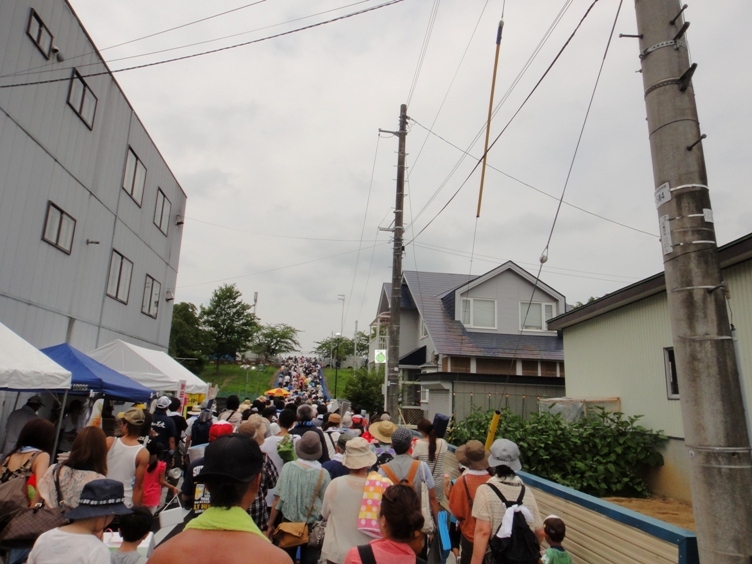 Many people around us were busy eating and drinking with friends and relatives. 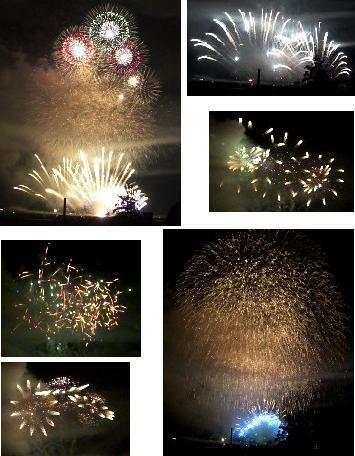 At 6.50 pm the nighttime fireworks display started with an ‘opening event’. We took a few photos and I compiled a video of this wonderful fireworks display. 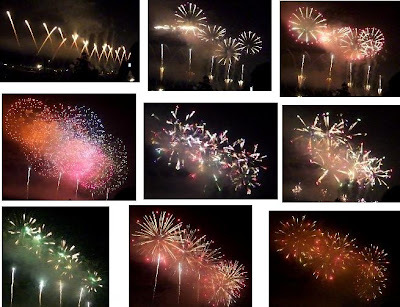 Next, the nighttime national fireworks competition started. Omagari annual national fireworks competition is divided into three categories, which are daytime fireworks (hiru hanabi), 30 centimeters round shell fireworks (10-gou warimono), and creative fireworks (sozo hanabi). The daytime fireworks was already over, which we skipped seeing. 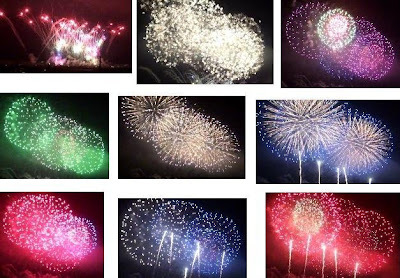 For the 30 centimeters round shell fireworks and creative fireworks categories, this year twenty eight fireworks artists and manufacturers from all over Japan competed and showed off their techniques. There were spectacular displays of fireworks that used latest fireworks technology and intricate techniques. We enjoyed viewing various kinds of colorful shapes and patterns formed in the night sky. 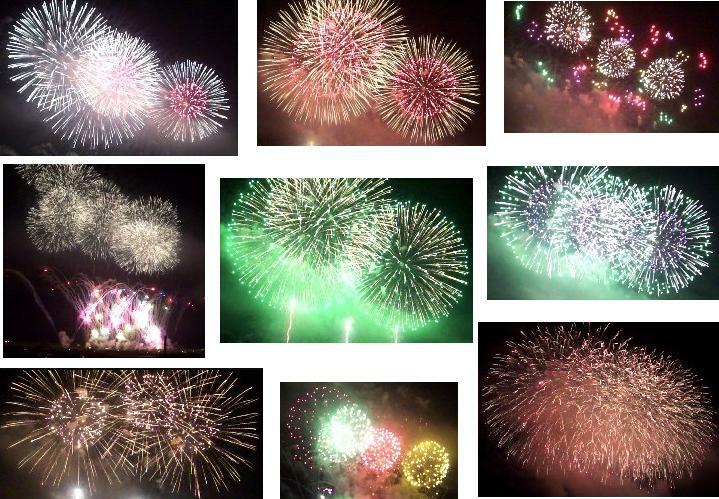 Since every year we take lots of photos of creative fireworks display, this year we skipped taking pictures and just enjoyed the wonderful show. 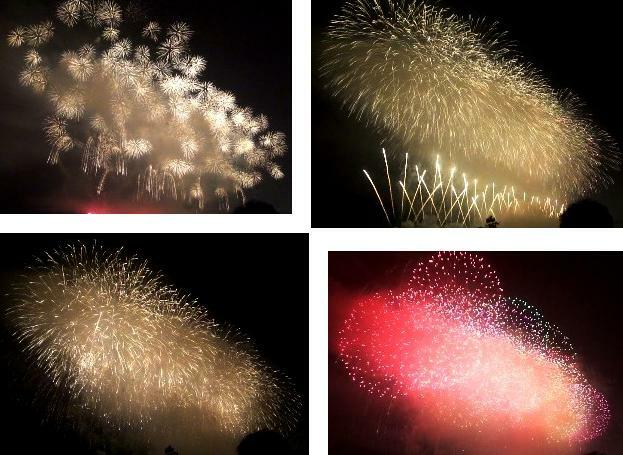 In between the creative fireworks competition, there were five grand fireworks displays called ‘sponsored special event’. These fireworks displays were not included in the competition but were wonderful and choreographed to exciting popular music. 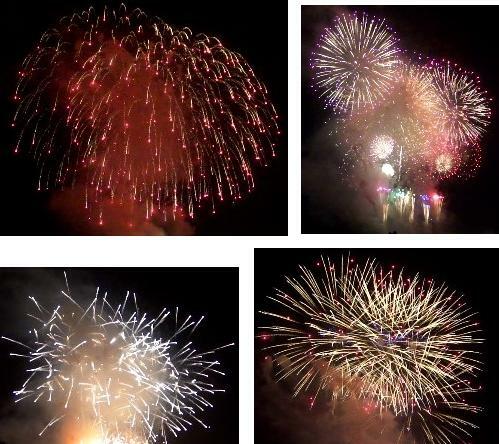 The fireworks rose into the sky one after another and then exploded into spectacular colorful patterns. 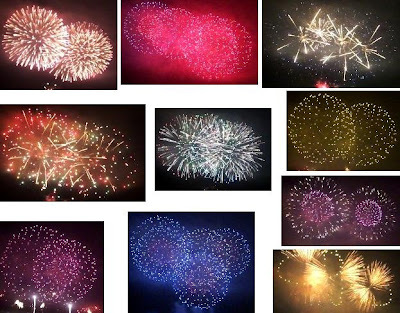 We took many photos of the fireworks patterns and I compiled videos of all the five ‘sponsored special events’ of the fireworks display. In addition, there was a fireworks display called the ‘main event’ where different fireworks artists and manufacturers collaborated to give an exquisite display of colors, lights, patterns, and sound. The theme of the main event was ‘Believe - yume o mirai ni tsunageyou’ which means ‘Believe - connect our dreams to the future’. 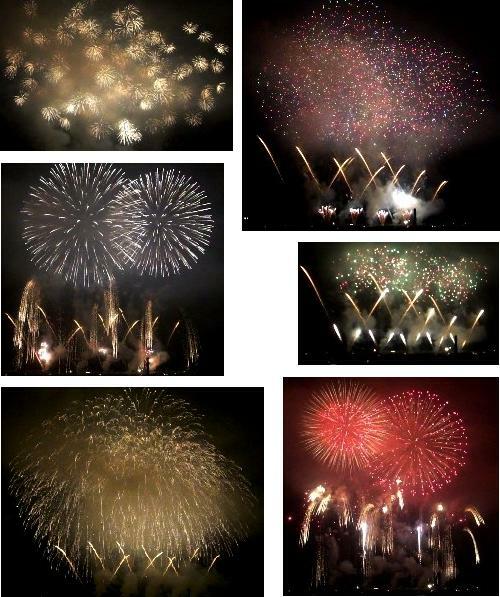 About 2600 fireworks were launched in five and a half minutes. The fireworks were deployed synchronously from several locations spread out across a large area of 550 meters. 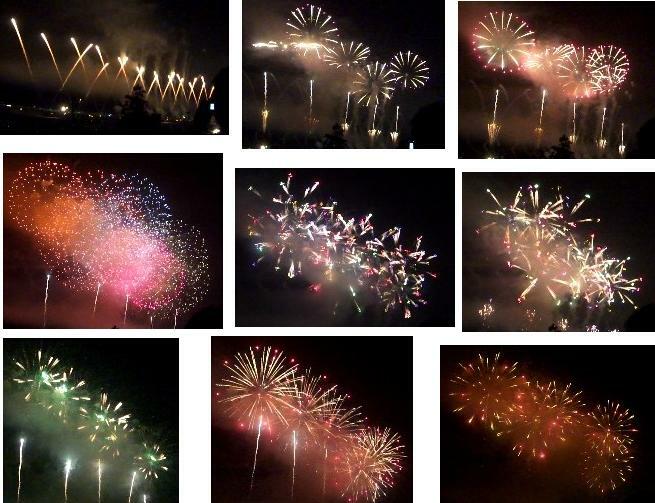 We were overwhelmed by the masterpieces and passion of the fireworks craftsmen that were on grand display. This fireworks display made a great impression on us. 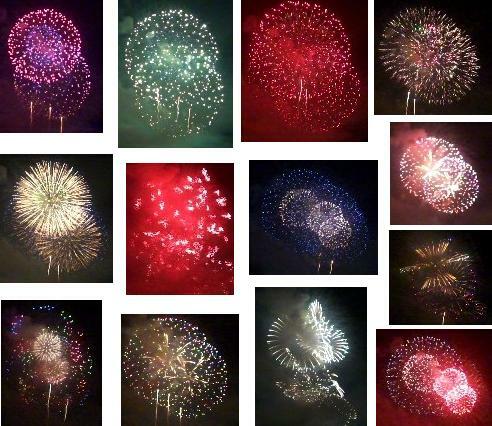 We took many photos of the fireworks patterns and I compiled a video of this extraordinary fireworks display. 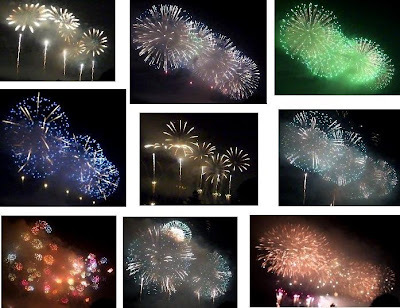 The display of creative fireworks by various fireworks manufacturers continued after the ‘main event’. 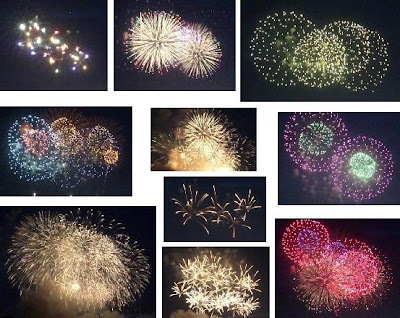 At about 9.30 pm, there was a ‘final event’ where a fantastic display of mostly round shell fireworks was carried out. We left the fireworks venue before the display of the ‘final event’ began but saw it while walking back towards the car parking area. 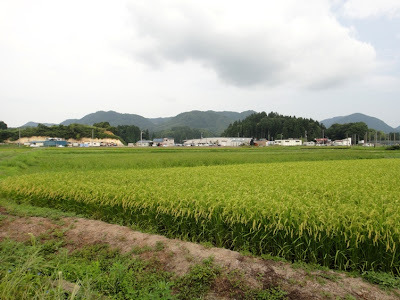 It took us about one hour to walk back to the car parking where we had parked our car. 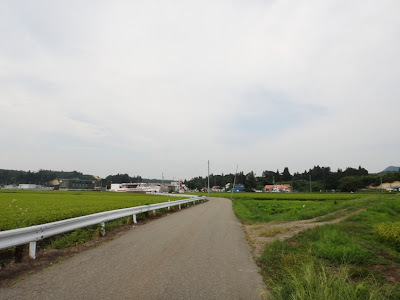 It was about 0.15 am of the next day when we reached back our home. We loved the exquisite and spectacular display of fireworks at Omagari Fireworks Festival. Thank you for the describing your visit and the lovely photos of the fireworks. It's a dream to be able to attend one day. I have a couple of questions, but first I would like to thank you for posting this information. You did a really good job with highlighting key points of this event. My question: Since you drove last time, would you recommend driving to this event again? Or, would you rather go by train? 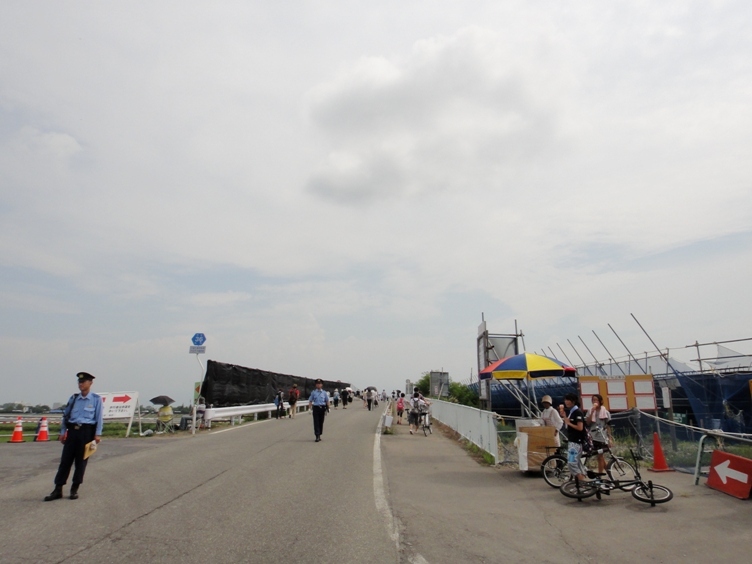 Is there ample parking space? I am thinking about driving to avoid the crowds. Thanks Kalavinka for your lovely comment. 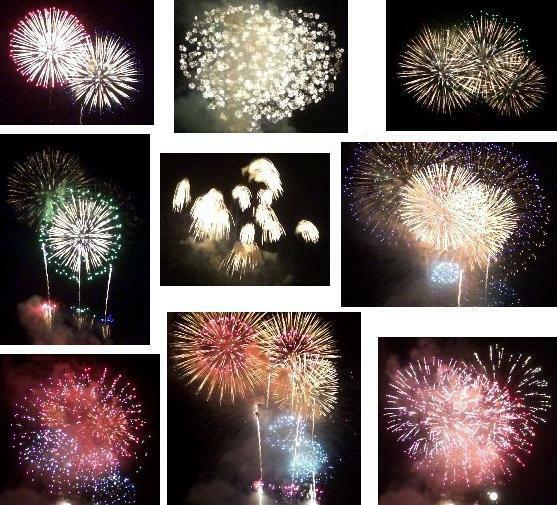 Hope you will be able to see the Omagari fireworks someday. It is beautiful.